Anthony Everitt’s fascination with ancient Rome began when he studied classics in school and has persisted ever since. He read English literature at Cambridge University and served four years as secretary general of the Arts Council for Great Britain. A visiting professor of arts and cultural policy at Nottingham Trent University and City University, Everitt has written extensively on European culture and development, and has contributed to the Guardian and Financial Times since 1994. Cicero, his first biography, was chosen by both Allan Massie and Andrew Roberts as the best book of the year in the United Kingdom. Anthony Everitt lives near Colchester, England’s first recorded town, founded by the Romans, and is working on a biography of Augustus. John Murray Pubs Ltd. PAPERBACK. 0719554934 New Condition. . New. John Murray Pubs Ltd. PAPERBACK. 0719554934 Like New Condition. . Fine. 2002-01-07. New. Ships with Tracking Number! INTERNATIONAL WORLDWIDE Shipping available. Buy with confidence, excellent customer service! 2002-09-12. Good. Ships with Tracking Number! INTERNATIONAL WORLDWIDE Shipping available. May not contain Access Codes or Supplements. May be ex-library. Shipping & Handling by region. Buy with confidence, excellent customer service! RB Large Print. Hardcover. 1402576536 . New. 2004-01-01. Large Print. RB Large Print. Hardcover. 1402576536 . New. RANDOM HOUSE. New. 8.17 x 7.3 cm. Random House, 2002-06-04. Hardcover. Used:Good. 2002-01-07. Good. Ships with Tracking Number! INTERNATIONAL WORLDWIDE Shipping available. May not contain Access Codes or Supplements. May be ex-library. Shipping & Handling by region. Buy with confidence, excellent customer service! 2003-08-08. Good. Ships with Tracking Number! INTERNATIONAL WORLDWIDE Shipping available. May not contain Access Codes or Supplements. May be ex-library. Shipping & Handling by region. Buy with confidence, excellent customer service! Prince Frederick, MD: RB Large Print, 2004. 583pp. ; HB brwns.w/white-colorphoto cover; dj taped to covers,otherwise fine condition w/clean,tight pgs. DJ brwns.w/white-colorphoto cover; taped to book otherwise fine. 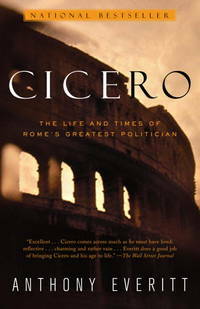 "Cicero is a lively look at a man who stood at the center of on of the most crucial times in Rome's history." large print.. Large Print. Hard Cover. Fine/Fine. 8vo - over 7¾" - 9¾" tall. Random House Trade Paperbacks, 2003-05-06. Paperback. Used:Good. In Stock. Always but with confidence. Westminster, Maryland, U.S.A.: Random House Inc. Almost Like New, "He Squared Off Against Caesar And Was Friends With Young Brutus. He Advised The Legendary Pompey On His Somewhat Botched Transition From Military Hero To Politician. He Lambasted Mark Antony And Was A Master Of The Smear Campaign, As Feared For His Wit As He Was For Exposing His Opponents Sexual Peccadilloes. Brilliant, Voluble, Cranky, A Genius Of Political Manipulation But Also A True Patriot And Idealist." . Very Good. Hardcover. First American Edition. 2002. Random House Inc. Reprint. Biographies & Memoirs. New. Brand New: This item is brand new unopened, never used and still in its original manufacturer condition. Random House Trade Paperbacks. PAPERBACK. 037575895X Special order direct from the distributor . New. Random House, 2002-06-15. Stated first edition. Hardcover. fine/fine. NOT an ex library book. Clean interior pages. Dust jacket has tear across top of spine, no chips, price is not clipped. Random House Trade Paperbacks. PAPERBACK. 037575895X . New. Random House Trade Paperbacks. PAPERBACK. 037575895X Minor shelf wear . Very Good. Random House Trade Paperbacks. PAPERBACK. 037575895X signs of little wear on the cover. . Very Good. Random House. Used - Like New. Like New condition. Very Good dust jacket. Random House, 2001. Later printing. Fine in fine dust jacket, in mylar cover. Random House Trade Paperbacks, 2003-05-06. Reprint. Paperback. Used:Good. Random House Trade Paperbacks. PAPERBACK. 037575895X . Very Good. Random House Trade Paperbacks. PAPERBACK. 037575895X *LIKE NEW* Ships Same Day or Next! . Fine. Random House Trade Paperbacks. PAPERBACK. 037575895X *BRAND NEW* Ships Same Day or Next! . New. Random House Trade Paperbacks. PAPERBACK. 037575895X Brand New From The Publisher! Not Marked Up Remainders or Shelf Worn Overstocks! . New. Random House, 2002-06-15. Hardcover. Like New. NICE CONDITION HARDCOVER BOOK IN DUST JACKET. NO WRITING OR MARKINGS IN THE TEXT, NO TORN OR MISSING PAGES. ALMOST NO WEAR TO COVERS AND DUST JACKET. FROM THE COLLECTION OF YALE CLASSICIST ANN ELLIS HANSON. I AM LISTING MORE THAN 1000 SIMILAR BOOKS ON ANCIENT GREECE & ROME, PLEASE TAKE A LOOK THROUGH MY LISTINGS. Random House Trade Paperbacks. PAPERBACK. 037575895X Brand New Book . New. Random House Trade Paperbacks, 2003-05-06. Paperback. Good. Random House, 2002-06-15. Hardcover. Good. New York: Random House, 2002. Black paper over boards with gilt spine titling. Rubbing along tail with shallow dings; nick at spine head. Clean, tight, square. DJ is chafed overall; has narrow creasing at extremities, folds--one long, one quite short--at rear inside flap.. Hard Cover. Good/Good. 8vo - over 7¾" - 9¾" tall. Used. Random House Inc, May-03. Trade Trade. Used - Acceptable. Binding, covers and pages are in acceptable condition. This means there is some wear, creases and/or scuffing. Some notes on back cover page. Front cover and one page creased. Satisfaction Guaranteed!! Random House Inc, May-03. Trade Trade. Used - Very Good. Satisfaction Guaranteed!! Random House Trade Paperbacks. Used - Very Good. 2003. Paperback. Very Good. NY: Random House. Very Good+ in Very Good dust jacket. 2002. Later Printing. Hardcover. 0375507469 . 9.60 X 6.60 X 1.40 inches . Random House Trade Paperbacks. Used - Like New. 2003. Paperback. Small publishers mark to text block. Otherwise, Fine. Random House Trade Paperbacks, 2003-05-06. Paperback. Like New. A sharp academic trade paper, clean with a tight binding with an unmarked text.From a private smoke free collection.Shipping within 24 hours a tracking number and delivery confirmation. New York, NY, U.S.A.: Random House, 2003. Fifth Printing. Trade Paperback. Very Good. Brief summary of content available upon request by e-mail. U S. A.: Random House Trade Paperbacks. As New. 2003. Softcover. 037575895x 364pp including index and Reader's Guide A Illustrations Maps A dynamic and engaging biography of Cicro druing the scancal-ridden world of ancient Rome. .
Random House Trade Paperbacks, May 2003. Trade Paperback Trade Paperback. Used Good. We carry new and used books in our storefront. We want you to be satisfied with your purchase. Please contact us if you have questions regarding this item.